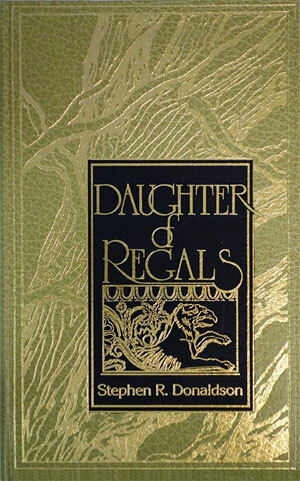 Daughter of Regals is a fantasy novella by Stephen R. Donaldson. It tells of a young woman called Chrysalis, the nominal ruler of three kingdoms who is about to come of age. To claim her throne, Chrysalis must exhibit the magical abilities of her ancestors the Regals - who combined the attributes of human men and mythical creatures - or else her dominions will collapse into civil war. While the kings of the individual kingdoms plot against her, Chrysalis struggles to release the magic inherent within her and claim her inheritance.